Kristan's baby girl is expected in just a few weeks and since she will be a fall little pumpkin, I thought some pumpkin cupcakes might be in order. I feel sure you all know Kristan from Confessions of a Cookbook Queen. I would say that Kristan is one of my very favorite bloggers, but you know what? She's more than that. She's one of my very favorite people. Her little Lucy is about to be welcomed into one adorable and loving family, full of sparkles and big brother's magic tricks. The cupcakes are a doctored up cake mix batter loaded with pumpkin and spices. The frosting...oh, the frosting! How about a buttery, cinnamon cream cheese frosting that's so good, you'll contemplate buying one of those beer helmets and converting it to a frosting helmet. Preheat oven to 350. Line 22 muffin cups with liners. 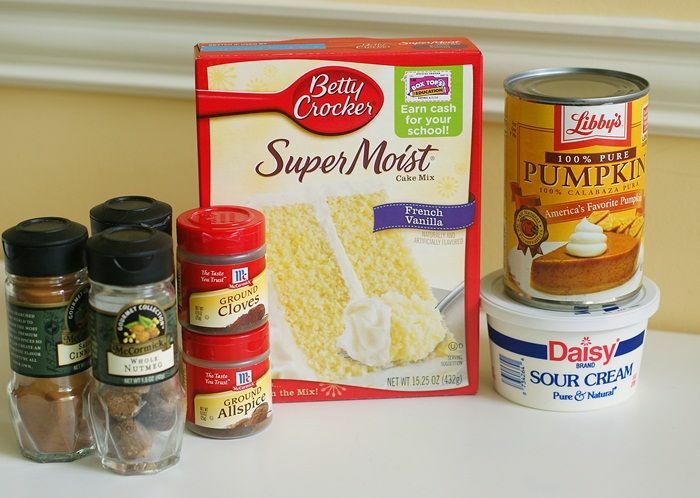 Whisk together the cake mix and spices. Add in the remaining cake ingredients. Mix on low until combined, then beat 2 minutes on medium. Scoop the batter into the lined tins and bake for 20 minutes, or until done. Let cool in the pan for 10 minutes, then remove to cool completely on wire racks. To make the frosting, beat together the cream cheese and butter until combined. Add the sugar in three additions, scraping the bowl as needed. Beat in the vanilla and cinnamon. To make the rose frosting, I used Created by Diane's video as a guide. I didn't have the correct tip on hand (I used an Ateco 828 star tip), but I still think they turned out pretty. Since Kristan likes sparkles, I sprinkled the rosy icing with a bit of sanding sugar. You know how all of us love a chance to celebrate a new bloggy baby, so there are lots of us celebrating Kristan & Lucy today. Go take a peek! So perfectly sweet and delicious sounding! I love how you brought together a beautiful fall treat with the sweet baby girl to be! These are adorable and what a great cupcake for a shower! The frosting just...mmmm, sounds...perfect! Those are beautiful. They sound yummy, too! 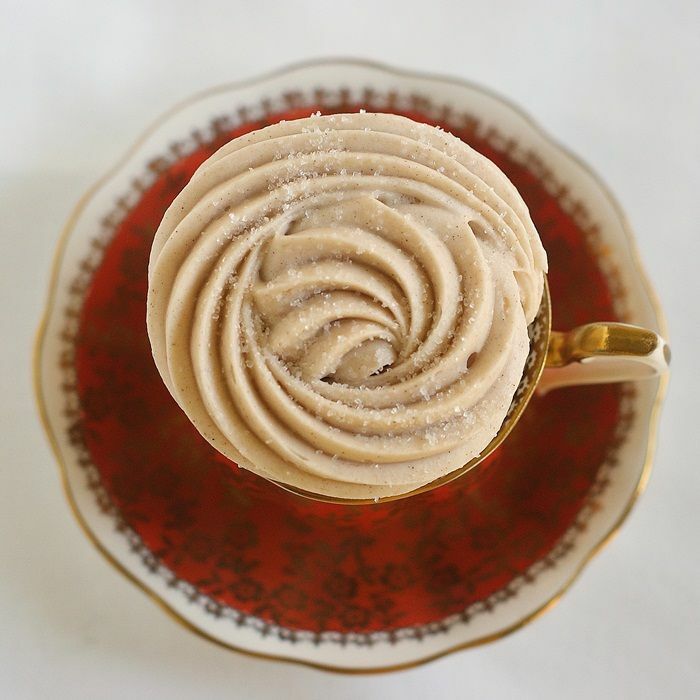 Can we talk about those gorgeous teacups? What a beautiful presentation! These look so sweet in the teacups. I hope your book signing went well up there in N. Houston. We went on that "Dumpling Crawl" with the Houston Chowhounds group. Won't be craving dumplings for awhile. Lucy seems to making a comback...such a cute name! Okay, I'm in for a frosting helmet. How do we make that happen? These are simply lovely, Bridget. If I had to pick a favorite cupcake for every season, these would absolutely be my answer for Autumn. Beautiful job. Perfect and delicious! I LOVE the cupcakes in the tea cups Bridget!! and um, that close up of the frosting.......I want to dive right in! Sign me up for the helmet! These look amazing. That frosting...and gorgeous rose! I love that you used a different tip...totally different effect and just as pretty! I could get down with a frosting helmet. Love your photos, as always! These are calling my name! Cinnamon cream cheese frosting? I could eat that on a whole lotta things, man. I totally and completely am in love with these. They look ridiculously delicious! And such pretty swirly frosting! Perfect for a fall baby. :D I can just imagine Kristan baking these one day for a tea party for baby Lucy! These sound scrumptious and they are stunningly beautiful as well!!!!!! I am sure Kristan will just love them! Perfect for one girls afternoon! Love the tea cups! 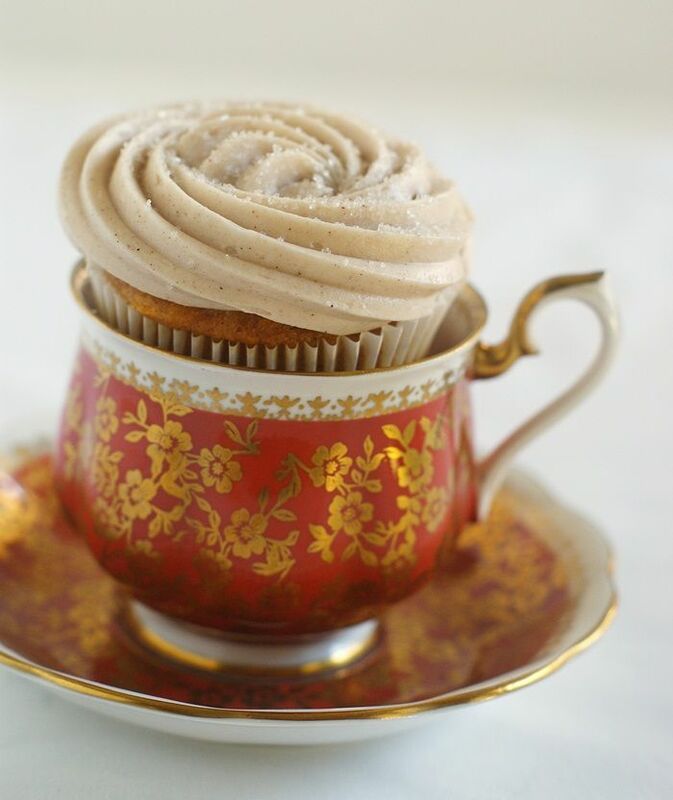 Preciousness - I love the presentation in a beautiful tea cup! Excuse me but I need a FROSTING HELMET! Seriously! 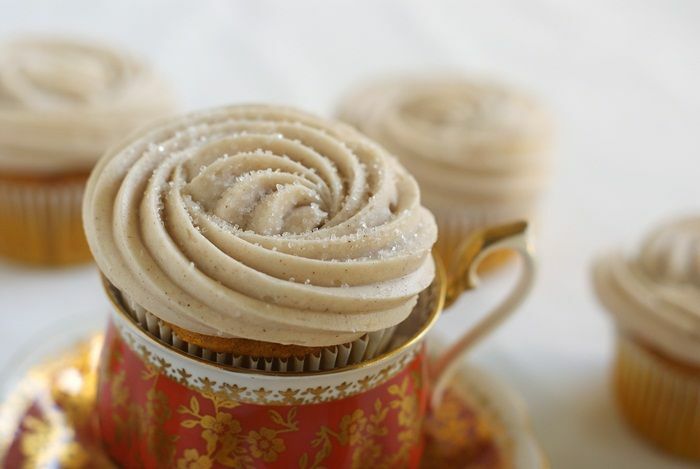 Buttercream Frosting with CINNAMON! 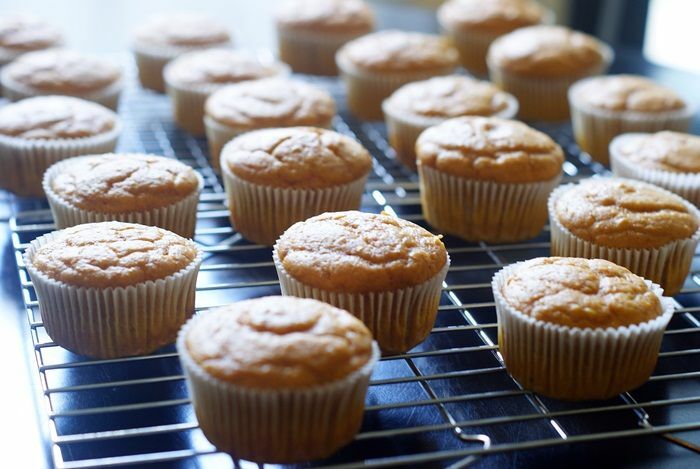 I bet your house smelled so yummy while these SPICED up PUMPKIN cupcakes were baking! Can you just imagine how adorable LUCY will dress! These cupcakes are cute too! That rosey frosting swirl is amazing! YOU BE SO TALENTED GIRLY! Love these Bridget and wishing Kristan all the happiness she gives others! seriously, could this frosting BE any more beautiful?! i love these! Wow...I want to jump into that photo. Gorgeous! Bridget you totally made me cry with this post. I can't even say how thankful I am that we connected online...you are such a sweet and classy lady and a true friend. You girls made my day with this shower. THANK YOU!!!!! Beautiful serving idea Bridget. Perfect for these gorgeous cupcakes. Love Kirstan. She's a mighty strong, very talented and very funny lady all wrapped up in the cutest little package. Best wishes to her and her family as they prepare to welcome their little Lucy into the world. These are so pretty. I love how you have them in little tea cups. I love visiting Kristans blog, it's always so bright and colorful and she has such a bubbly personality - it jumps right out of the monitor! I can't wait to hear all the fun things she'll be decorating for her little girl and I'm sure her son will be helping her every step of the way! How fun that you're all doing this for her. That frosting just looks so amazingly luscious. I love that you put them in the mugs and added a bit of sparkle for Kristan. 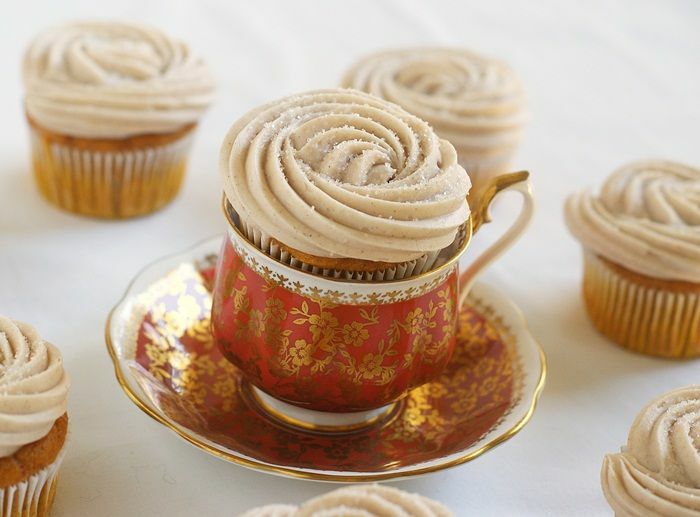 oh these cupcakes look absolutely delicious, I just bought some more pumpkin and will put these on my list! Glad you liked the video on frosting :) thanks for including it in your post. You are so sweet. XXXOOO! What a fun shower for Kristan, can't wait to meet her sweet Lucy! Oh my gosh! I found you through Pinterest, and boy howdy are your site and recipes gorgeous! I featured your Candy Corn Cookies on my site, www.iPinnedIt.com, which shows off the PROPS! and FLOPS! off of Pinterest. Your cookies are definitely a PROP! So, so darling! These are just lovely!! And that frosting is perfection! Wow. It's really sad that a blogger can be made famous for baking cupcakes from a box. The realitly is that MOST people find baking a cake completely from scratch over whelming and ONLY use box cake mixes. Those people will be excited by this recipe and feel like they can make this. If you look into the other recipes on this blog, you will notice that it's almost all scratch baking. How sad that most people are too lazy to bake a cake from scratch. It's probably a whole three more steps than baking one from a box and most things are pantry and fridge staples. These cupcakes are just darling! We were definitely on the same wavelength in regards to flavor combinations! Aww, congrats to Kristan! I know everyone can't wait to see little Lucy! And these pumpkin cupcakes sound amazing! I agree with Gail, your presentation is stunning! yum yum yum. these are perfect for fall. S'IL VOUS PLAIT LA RECETTE EN FRANCAIS ? Bridget, I made these about two weeks ago, and OH MY GOODNESS! They were amazing! 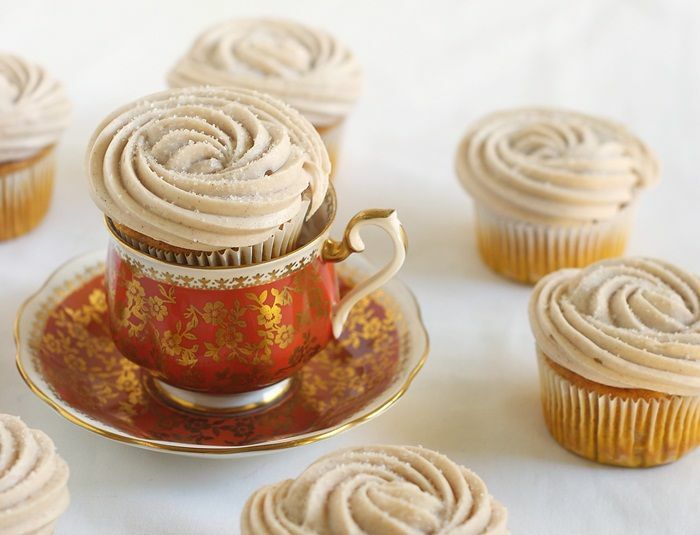 I could have eaten the frosting by the spoonful ;) Thank you so much for this post, these cupcakes were, easy and fun to make, and outstanding in flavor! I got many compliments, so I had to come THANK YOU, where the credit is due!! Thank you, I have recently been searching for information about this topic for a while and yours is the best I've found out so far. But, what concerning the conclusion? Are you positive in regards to the source?